Referring to the appointment of Christoph Mueller as the new CEO of Malaysia Airlines (MAS), Tun Dr. Mahathir, with his usual sarcasm, said MAS failed because Malaysians are stupid [See Malaysia Insider report below]. It is so typical of him to blame Malaysians and everyone else for the problems that he himself bears much of the responsibility for. The fact is Malaysians didn’t fail; it was the incompetent cronies that Mahathir and his successors appointed to head MAS (and many other government own corporations) that failed Malaysians. Years of mismanagement, incompetence and corruption reduced a great airline that Malaysians were rightly proud of to the struggling, debt-ridden, mediocre airline it is today. Was anyone ever held accountable for the massive and repeated losses that was ultimately borne by tax-payers? In many other countries, the minister responsible would have at least resigned. In Malaysia its never anyone’s fault; those who complain are, of course, anti-national, Jewish agents or out to undermine the special position of the Malays. It has been said that the definition of insanity is doing the same thing over and over and expecting different results. In business, the definition of insanity may well be recycling the same bunch of incompetent cronies over and over and expecting different results. Malaysian corporate history is full of examples of cronies who made a mess of one appointment being rewarded with an even more lucrative appointment. Perhaps, Mueller’s appointment is a sign that UMNO has finally lost confidence in its own cronies. Mueller’s appointment also speaks volumes about the attitude of UMNO on another matter. Surely, there can be no doubt that there are competent Malaysians who can also do the job. However, for that, UMNO will have to look beyond its tight circle of cronies but UMNO is too confined by its culture of racism to do that. They would, for example, rather import a foreigner than employ a non-Malay for the job. In this connection, it is worth noting that Malaysia Airlines (then known as Malaysian Airline System) was set up in 1972 by Tan Sri Saw Huat Lye who also served as its first general manager and laid the foundations for what was to become a successful airline. Saw was succeed by Tan Sri Abdul Aziz Abdul Rahman who took the airlines to even greater heights until cronyism and racial politics crippled the company. I hope Mueller’s appointment does not set in motion a pattern where senior positions in government-owned and government-linked corporations are outsourced to foreigners just to avoid hiring competent non-Malays. All citizens have a right to be considered for any job in the land if they are competent and qualified irrespective of their race or religion. 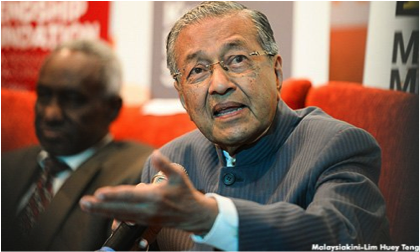 Malaysia Airlines incurred losses because Malaysians do not know how to manage aviation, former prime minister Tun Dr Mahathir Mohamad said today. MAS main shareholder Khazanah Nasional Berhad announced Mueller’s appointment in a statement yesterday. Mueller, who will be the first non-Malaysian chief executive of MAS, will also join the board as a non-executive director. Celcom chief executive Datuk Seri Mohammed Shazalli Ramli will also join the MAS board as non-executive director. His and Mueller’s appointments to the board will be effective January 1. The appointments are part of the sovereign wealth fund Khazanah Nasional’s efforts to rescue and restructure the airline.